2018 Volunteer of the Year: Gary G.
We are delighted to honor Gary Gellin as ExtraFood’s Volunteer of the Year. He has completed more than 250 food trips this year, rescuing and delivering more than 10 tons of food for people in need. But beyond the sheer size of the impact Gary has made for ExtraFood and our community, Gary has gone above-and-beyond in his just-in-time availability for ExtraFood. If a volunteer cancels their commitment to a food trip at the last minute, if we have an unfilled trip and the clock is ticking, or if we have a spontaneous food donation that needs quick service, it is “Go-to-Gary” time and again who selflessly jumps in not only to rescue the food but our staff as well! And he is unfailingly friendly, professional, and reliable in his work for ExtraFood. Gary truly embodies ExtraFood’s motto, “Food recovery with the human touch." 2017 Volunteer of the Year: Ellen Mc. We are delighted to honor Ellen Mc. as ExtraFood’s 2017 Volunteer of the Year for the above-and-beyond service and leadership she has provided for Marin’s hungry over the past 4 years. Since joining ExtraFood as a volunteer food runner in February 2014, just two months after ExtraFood began operating, Ellen has completed nearly 500 food trips, recovering more than 15 tons of food for the vulnerable people we serve. Playfully dubbed our “Food Recovery Angel” for her uncanny ability to swoop in and cover volunteer gaps in our food delivery schedule on any given day, it's no wonder that Ellen was among the first volunteers to be inducted into our new “Food Recovery Heroes” volunteer group this year. Each member of this select group of outstanding volunteers has not only completed a minimum number of food trips every year for the past three years but has also demonstrated exemplary reliability, consistency and long-term commitment to ExtraFood's mission. Members were acknowledged at a special event with ExtraFood’s staff and Board, and had their names inscribed on a permanent plaque at ExtraFood’s office. While Ellen’s dedication to food recovery is truly remarkable, her impact is further felt by her efforts to acknowledge and advance our all-important volunteer team. Recognizing the value of supporting her fellow volunteers, Ellen has volunteered to help organize ExtraFood’s annual Volunteer Appreciation event every year, has helped launch our volunteer name badge “milestone” incentive program, and is a mainstay at ExtraFood fundraising events – not only supporting our fundraising, but also always engaging with our volunteers at the events to motivate and inspire them. It is an honor to work with Ellen, whose personal ambition is to shine the light on others. She has devoted her time, energy, and generous heart to reducing food waste, delivering food for Marin’s hungry, and helping cultivate the very core of ExtraFood’s food recovery program: our extraordinary volunteer team. Ellen truly embodies ExtraFood’s values, as reflected in our motto: “Food recovery with the human touch.” We feel so fortunate that she has chosen ExtraFood, our partners, and the people we’re serving together as the grateful recipients of her boundless generosity, enormous impact, and exemplary service. 2016 Volunteer of the Year: Don C.
We’re delighted to honor the amazing Don C. as ExtraFood’s 2016 Volunteer of the Year. Don joined our team in February as a volunteer food runner. Since then, he has completed 322 food trips in just 10 months. That’s a record number of food trips completed by a volunteer in one year! And, on top of that, he once did 13 food trips in a single week! Another record! He has delivered a total of 20,000 pounds of food: 10 tons in 10 months. 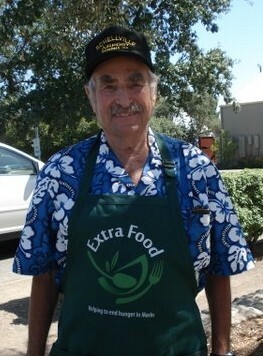 That’s incredible work, but Don has also lent his expertise in helping us recruit new food donors, and he also initiated the process that led ExtraFood to start a new food program with the College of Marin. Don has massive amounts of energy, enthusiasm, and brings a cheerful attitude with him on all of his food trips. All of our food donors and recipients know when Don has arrived because they can’t miss that huge grin on his face! He has become an expert at knowing many of the nonprofits we serve, as well as developing relationships with their staff so that he can make on-the-spot decisions when necessary. The entire ExtraFood staff feels truly lucky to have such a dedicated, passionate, and wonderful volunteer on our team. We salute Don, our Volunteer of the Year! 2015 Volunteer of the Year: Lee S.
We’re proud to honor Lee S. as ExtraFood’s 2015 Volunteer of the Year. He’s been with us for 18 months and completed his 300th food trip a few weeks back! And he has no intention of slowing down. “Life has been sweet to me”, said Lee, letting us know that he feels lucky that he has the time and ability to give back to his community. “You get back what you give” was Lee’s reply when asked why he loves to volunteer for ExtraFood. He gets it back big-time when he’s doing his four weekly food trips—whether it’s a generous hug from a recipient, to a friendly wave and maybe a taste of food from a food donor. He’s a great communicator, frequently passing along important information from donors and recipients, and is a wonderful ambassador for ExtraFood in our community. We all feel it’s an honor to be working with Lee to help end hunger in Marin. 2014 Volunteer of the Year: Lynne S.
- She has worked diligently and tirelessly on the effort to recruit new food donors, not only leading other volunteers to do so but personally recruiting quite a number of food donors herself. 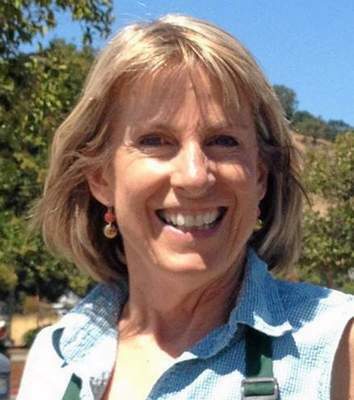 - She has almost invariably captained our teams at the Thursday and Sunday Civic Center farmers’ markets, not to mention doing the Tam Valley and Mill Valley farmers’ markets trips regularly. - Her tireless efforts to spread the word about ExtraFood have had a huge impact on the awareness of ExtraFood throughout the county. - There are so many other ways that Lynne has contributed to ExtraFood’s growth and success, too many to enumerate here. But any start-up needs people who “pitch in” and do all sorts of things that just plain need doing, and Lynne has done tons of those. 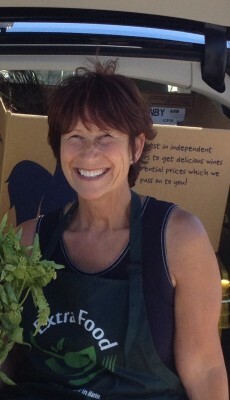 Like our fantastic ExtraFood aprons, which reflect Lynne’s boundless creativity! And what Lynne brings most of all is a huge passion for feeding the hungry and ending food waste—and a big, giving heart—that has fueled her dynamic and dedicated work for ExtraFood this year. Rich has already left his mark in the short 6 weeks he has been volunteering with ExtraFood. Seeming to always be at the ready to jump in and help, he has quickly racked up over 20 food trips, delivering 600+ lbs of fresh food to support some of the most vulnerable members of our community from Marin City to Novato. How lucky are we to have such a go-getter on our team?